MSC Cruises is the world’s largest privately-owned cruise company and the number one cruise line in Europe and South America. A game-changer in the world of cruises, the MSC Cruises fleet currently comprises 16 (excluding Virtuosa and Grandiosa) ultra-modern, highly innovative and elegantly designed ships, offering an unparalleled holiday experience with always delicious and authentic food, award-winning entertainment, plenty of relaxation, comfortable accommodation, as well as impeccable service and expertise. 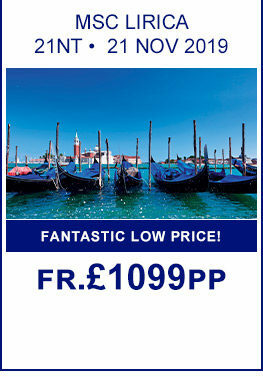 A Selection of our best MSC Cruises Offers for the Med & Beyond! Includes FREE Safari Game Park Drive to spot the Big Five! Add 3 day Tokyo, Mt Fuji, Bullet Train Tour fr £399! 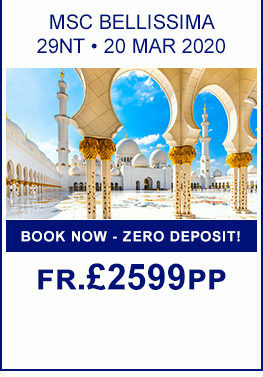 , Book Now - ZERO Deposit! 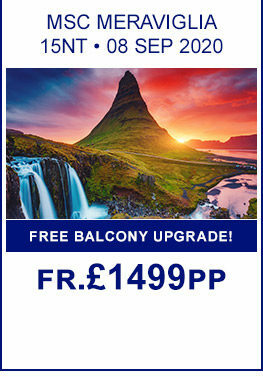 , Book Oceanview Get FREE Double Upgrade to Fantastica Balcony! FREE full day game drive safari – your chance to spot the Big Five , Victoria Falls experience & Game Reserve Drive to spot the Big Five! 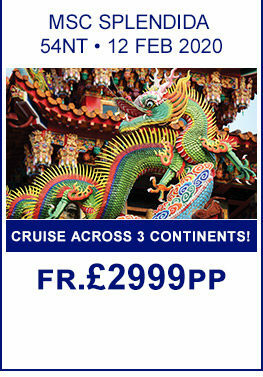 Includes Tokyo, Mt Fuji and Bullet Train Tour , Book Now - ZERO Deposit! Despite a strong focus on the Mediterranean, the MSC Cruises fleet goes much further than the sunny stretches of Europe. An amazing 190 destinations across 73 different countries can be explored as part of MSC Cruises’ itineraries offering more than 2,000 carefully-planned excursions for port calls. If you can’t decide where in the world to explore with MSC Cruises, the MSC Grand Voyages itineraries can take you everywhere! With worldwide journeys taking in destinations across the globe, the MSC Grand Voyages travel from north to south and east to west, visiting a huge number of beautiful countries and regions. Watch our video and see what MSC Cruises has to offer!